How to draw Knuckles the Echidna from Sonic the Hedgehog. 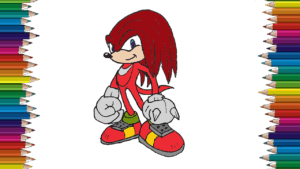 Knuckles the Echidna step by step with this how-to video and step-by-step drawing instructions. How to draw cartoons for kids and everyone. Mark the width and height of the image. Draw an oval for Echidna’s head. Draw a straight line, which will serve as the center of his head and body. Add instructions for your role. Draw instructions for Knuckles’s body, legs and tail. Add a smooth line to locate for your spikes. Draw the shape of the leg and locate the echidna eye. Sketch of the character’s snout, hands and sneakers. Add soles and shoelaces. Sketch Knuckles eyes, tails and gloves. Add noses, students, needles and fingers. Glove details. Sketch Echidna mouth and stockings. Work on the whole figure, paying special attention to details.